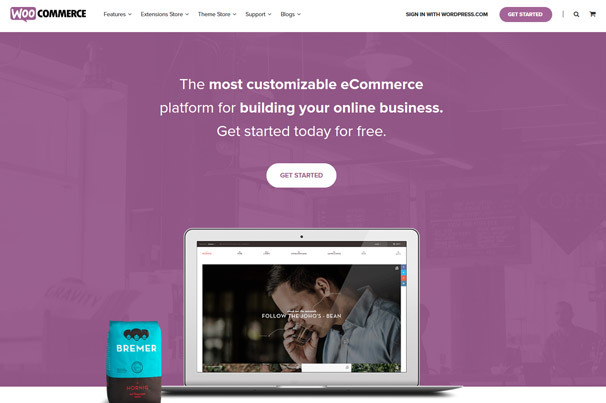 WooCommerce vs Shopify: Which is the Best eCommerce Platform 2019? 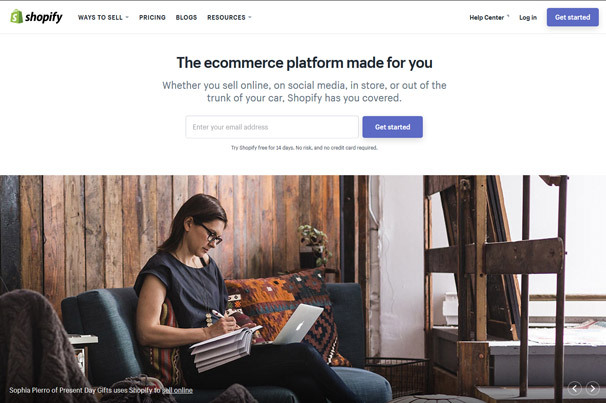 WooCommerce vs Shopify: Which is the Best eCommerce Platform in 2019? WooCommerce and Shopify power a significant portion of all online stores on the web. In fact, WooCommerce powers 41% of all online stores on “the entire Internet” while Shopify powers 6%, meaning these two platforms power just under 50% of the ecommerce world. Creating WooCommerce vs Shopify showdowns is inevitable because of this, and that’s exactly what we’re going to do in this post. Both of these platforms are capable of powering the web’s most sophisticated online stores, but we’re going to focus on their subtle and not-so-subtle differences, their benefits as well as their shortcomings to help you select a platform for your or your client’s shop. Without further ado, here is the AlienWP WooCommerce vs Shopify showdown. WooCommerce was founded in 2011 after the developers of WooThemes (Mark Forrester, Magnus Jepson and Adii Pienaar) failed to acquire a WordPress development company by the name of Jigowatt. They forked the company’s popular ecommerce plugin JigoShop and revamped it into the ecommerce platform we know today. The plugin has been downloaded over 27 million times and is used to power millions of online stores across the Internet. Shopify was founded in 2006 by a modest team of five people, each of whom had an entrepreneurial spirit about them. They noticed their frustrations in building their own online stores were shared by fellow “wantrepreneurs,” so they came up with a solution designed for folks who struggled with the technical sides of business. Today, Shopify has team of over 1,700 people working in five different offices across North America. They also have hundreds of thousands of customers who have netted a whopping $24 billion+ in sales. This is the real battle going on in this post. WooCommerce is an open-source platform while Shopify is an all-in-one solution. Open source more or less means you have more control over what you add to your site and how you use it. All in one means the platform controls everything you’re able to add to your site as well as how you use it. There are pros and cons to using both of these types of platforms. Open-source platforms are typically free or available at low prices while all-in-one platforms are typically on the pricier end of things. Open-source platforms also give you more freedom and control over the way you handle your website, but this can also be a con. This is because open-source platforms, including WooCommerce, tend to require knowing how to perform a few technical actions. Nearly everything is handled for you in an all-in-one environment. The biggest difference between the open-source nature of WooCommerce and the all-in-one approach to Shopify is the fact that you need to purchase and set up a hosting account separately with WooCommerce while this service is included with Shopify. This cuts back on a number of different technical hurdles that may keep some from using WooCommerce. This all-in-one approach to web development is also great for support and security. Anyone can release a plugin for WooCommerce, which has led to many low-quality plugins and themes. Everything is tested, however, in an all-in-one environment, meaning the chances of getting hacked or having your website break from extensions are slimmer. However, this trade-off is met with themes and extensions that are much more expensive, but we’ll get to that in a bit. Let’s switch gears and get into specifics. The cost of the platform itself. The cost of transaction fees. WooCommerce is a WordPress plugin, and the plugin itself is free. It’s the price of hosting, themes and essential extensions that make this platform seem more expensive. Pricing for Shopify starts at $29/month when you exclude the Lite plan, which only allows you to sell on Facebook or your own website. This includes hosting but does not include the price of a theme or extensions. VPS hosting and cloud hosting are recommended for ecommerce, so expect to pay at least $15/month for hosting. You can try out shared hosting if you wish, which typically cost only a few dollars per month. There are a number of different payment gateways available free of charge with WooCommerce. These include PayPal, Stripe, Amazon Pay, PayFast, Propoza, LevelUp, Klarma and ICEPAY. If you want to add additional payment gateways, such as Authorize.net or PayPal Express, you’ll need to pay $49-$199/year/payment gateway. Most payment gateway extensions are either $49 or $79. However, WooCommerce does not charge its own transaction fees over the ones payment gateways charge. 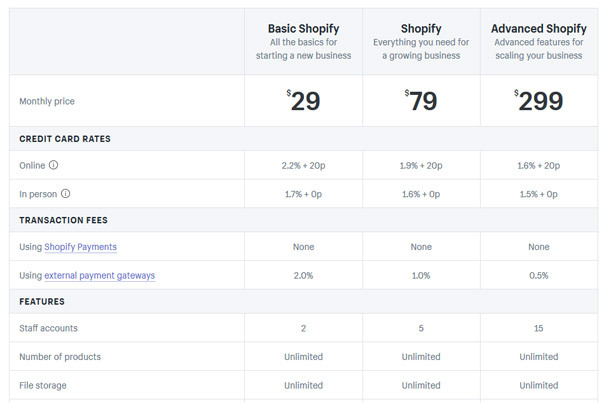 Shopify comes with its own payment gateway called Shopify Payments, which is really just Stripe. You will not be charged with a single transaction fee if you use this payment gateway. You won’t need to pay extra to use other payment gateways, meaning you won’t need to buy extensions as you do with WooCommerce, but you will be charged an additional 2.0% fee per transaction. This is on top of the 2.9% + $0.30 transaction fee most payment gateways charge. This means you’ll pay 4.9% + $0.30 per transaction if you want to use PayPal as a payment gateway. Themes are extremely cheap with WooCommerce. 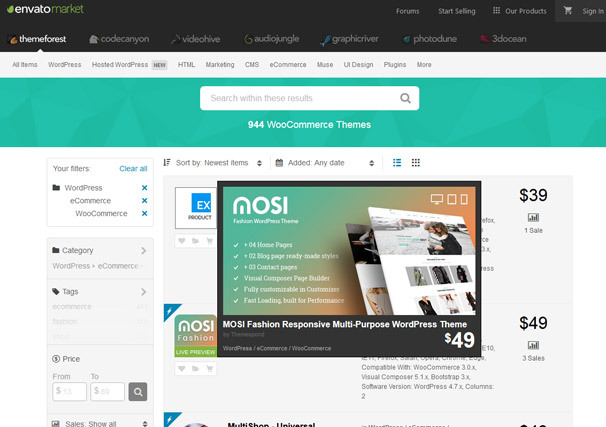 You can download free WooCommerce Themes or Premium Themes which only cost somewhere between $39-$99 and average out at around $59. 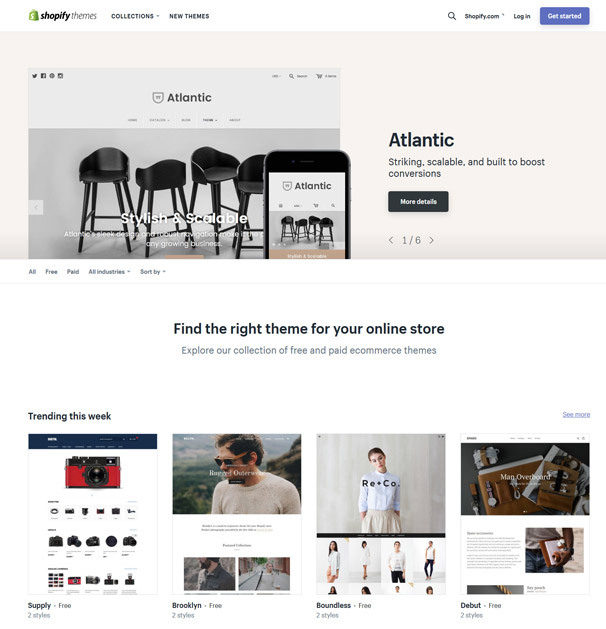 Shopify has a small handful of free themes, but its premium themes cost a minimum of $140. Extensions are called “extensions” or “plugins” in WooCommerce. They’re called “apps” in Shopify. There are thousands of free plugins available for WooCommerce, and the premium ones are only available for $19-$99/year. Shopify has a few free apps of its own, but pricing can get a little outrageous for premium apps. Some are simply $5 – $99/month, but some cost hundreds of dollars to use every month. Let’s talk about how each of these platforms handle store management in terms of products and analytics. Both platforms allow you to create an unlimited number of products, but the ways they allow you to create and manage them are a little different. WooCommerce is definitely the more flexible platform. It allows you to have multiple product variants and organize products into parent categories, child categories and tags. Shopify, on the other hand, only allows you to create three variants per product, and you can only organize products into parent categories and tags. Both platforms feature detailed stats and reports, but Shopify definitely wins in this department. It allows you to break down sales by month, hour, product, product variant, SKU, vendor, marketing campaign and more. You can also keep track of abandoned carts and send reminder emails. Speaking of marketing campaigns, these reports also allow you to keep track of customer acquisitions by showing how many customers make purchases from specific landing pages. WooCommerce has detailed reports as well, but they’re focused on sales. You can view stats on the amount of sales you’ve received, the amount of traffic you’ve received, your net sales, your gross sales as well as all of the refunds your store has processed. You can extend functionality through integrations with Google Analytics, Kissmetrics and Mixpanel. Other extensions and third-party plugins allow you to add stats on cost of goods, cart reports, customer history and coupon campaigns. Let’s talk about themes. WooCommerce’s theme library dwarfs Shopify’s theme library. There are 4,700+ WooCommerce themes at ThemeForest alone (with hundreds more available all around the web) while Shopify only has a library of over 45 themes. This gives WooCommerce a huge edge over Shopify as design plays a large role in marketing. Both platforms do really well as far as design goes. WooCommerce may have a lot more designs to choose from, but both platforms offer stunning designs and smart layouts that feature modern styles in web design. They’re also really easy to use, only Shopify’s ease of use is dependent on a single, in-house application while WooCommerce’s is dependent on the theme you use. Shopify offers something called Shopify Sections, which is a drag-and-drop page builder that allows you to choose the layouts and styles your pages use. WooCommerce is a WordPress plugin, so if the developer of the theme you use doesn’t use their own page builder, you can likely add this functionality through an integration with popular page builders like Visual Composer, Divi Builder, Beaver Builder, Elementor and Cornerstone. WooCommerce also has an edge over Shopify when it comes to blogging. This is because WooCommerce is built for WordPress, the web’s largest and most powerful blogging platform. Not only can you create a powerful, well-designed blog, you can also enhance it with numerous extensions. You can even organize your content with parent categories, child categories and tags. Shopify only allows you to organize your content with tags, which can get pretty messy in terms of content management, user experience and SEO. WooCommerce is an open-source platform, so any developer can create a plugin for it. This is why you’ll see thousands of free WooCommerce plugins in the WordPress plugin repository and thousands more at CodeCanyon and independent developer sites but only about 1,200 apps in the Shopify App Store. Both platforms, however, offer hundreds of ways to extend the functionality of your store despite the difference in the number of extensions they have. You can add changes to the way you handle products, shipping, orders, returns, abandoned carts, marketing, sales, web design and just about anything else you can think of. 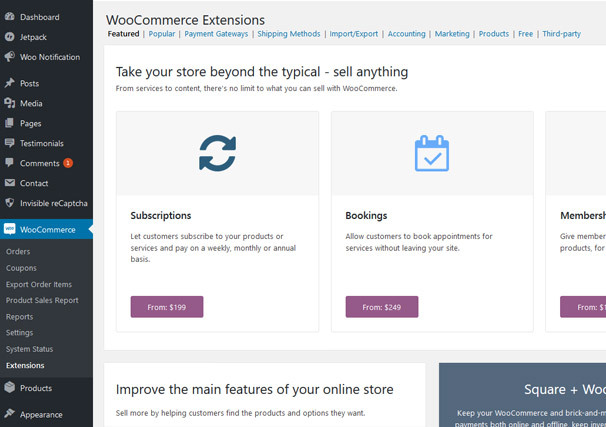 Using extensions to decide between these two platforms isn’t a great idea as they both have a lot to offer, but you can take the fact that WooCommerce has a lot more free and affordable extensions into consideration. Shopify definitely wins this one, but that’s partly due to the way open-source and all-in-one platforms are handled. Shopify does offer more in terms of customer service, and WooCommerce has often been criticized for their lackluster support terms. Let’s get into specifics. Shopify offers 24/7 support via live chat, email, phone and Twitter. WooCommerce, on the other hand, offers support during set hours Monday through Friday and only offers support via a ticket system. We can point out the differences between open-source and all-in-one platforms when we discuss what types of things these two customer service teams offer support for. Shopify has control over their entire ecosystem. They have control over the platform you use, the theme you use, the apps you use and more. Their customer service team can help you with any problem you have because of this. WooCommerce can only help you with their own plugin, themes and extensions. If you purchase or download themes and plugins from third-party developers, you’ll need to get support separately from those developers. Same goes for hosting. This is a major reason why many, especially those who aren’t experienced in web development, prefer all-in-one solutions like Shopify and Squarespace over open-source platforms like WooCommerce and WordPress. Shipping is something these platforms are fairly equal on. Both platforms offer a lot of great features for shipping, and both offer free and premium extensions that allow you to, well, extend the default shipping functionalities. Both allow you to use several carriers and offer rates based on different factors, including weight and price. Both also allow you to create shipping zones. Shopify does, however, give you access to discounted shipping rates if you use the United States Postal Service or CanadaPost. WooCommerce and Shopify are wonderful platforms to use to build and run online stores, and they both have their own sets strengths and weaknesses. The one you choose is dependent on your needs and budget, whether you’re a developer building a store for a client or a store owner building their own website. If you’re a developer or business owner capable of figuring things out easily, you may be better off with the amount of flexibility WooCommerce offers. Shopify is powerful, but it can be slightly limiting depending on what you need. This is where WooCommerce shines. If you’re a business owner who doesn’t have the time or patience to learn the technical side of things, you may be better off with Shopify as it is a lot more beginner-friendly. If you have your heart set on WooCommerce, check out a few managed WordPress hosts. They offer quality servers and take care of a lot of the technical details for you. WooCommerce also shines when it comes to pricing for a number of different things, including transaction fees, themes and plugins. It also offers more options when it comes to creating products, and you can add nearly any functionality to your site with the sheer amount of themes and plugins available for this platform. Shopify can be a lot easier to use and figure out, and they offer more in terms of customer service and reporting. This is why it’s recommended more for shop owners or developers who need to give their clients a lot of access to the backends of their shops. WooCommerce – cheaper in some areas, more expansive, more flexible for creating advanced stores and ownership of all aspects of the site.